Since this is a two minute show, it looks like I’m going to brief for once! A narrator begins the Blood Type Quiz and asks which blood type doesn’t show their feelings when in love. What follows is a series of VERY short scenes, giving each anthropomorphized blood type a chance to show their characteristics. A can’t decide whether or not to confess, B is impulsive, O is very direct and maybe a little TOO honest and analytical, and AB plays hard to get. When they hit the Olympic-style winner’s platform, sure enough, AB ends up on top. Overtop of the ceremony, a disclaimer is given that you should never talk bad about someone just because they fit the stereotype of their blood type. This is a fun little show for me because it’s clear from character profiles in manga and other anime-related materials that the Japanese put a certain predictive value on blood type. This seems quite reminiscent of the stock people put in other forms of astrology, but since blood types never seem to be explained in the literature I’ve never had an idea what any of them were supposed to mean. 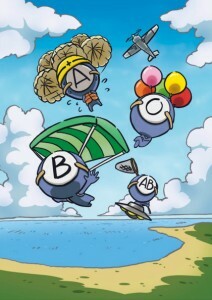 The ending theme that airs after the minute-and-a-half of episode content breaks down the stereotypes of the blood types in a nutshell. This is a nice little diversion and nothing more, but with each episode clocking in at 2 minutes (including the theme song), it’s really only supposed to get its gag in, get the laugh, and get out.